Heavy flooding is not often a cause for raising a glass, but two pub managers in Leeds have shown they are not going to let the adverse weather get them down. 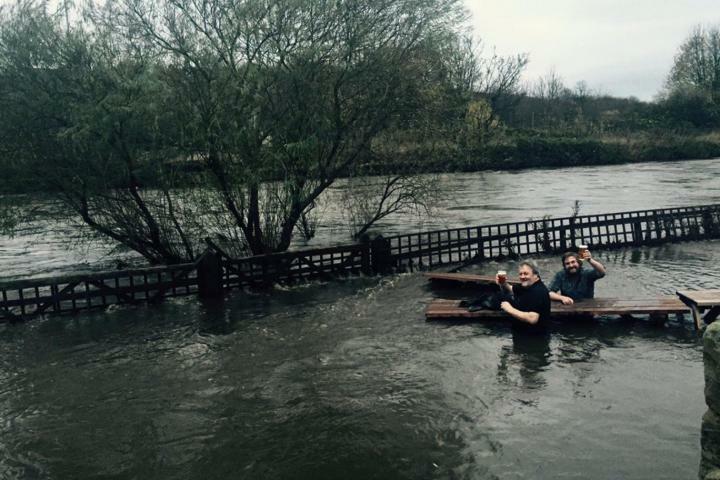 John Kelly and Steve Holt, managers of the Kirkstall Bridge Inn, have been pictured in their beer garden having a pint while sat under several feet of water. The image (seen here) of the resilient landlords, which was posted on Twitter, quickly went viral over the weekend. The landlords might put a brave face on in the aftermath of the floods brought about by Storm Abigail, but the damage done across the north of England and Scotland by the floods is a reminder of why companies need to have business insurance in place that will cover their premises and assets against this risk. Whether it is specialist pub insurance or office insurance, companies can also obtain business interruption cover, which will provide financial support if the business has to close its doors for an extended period of time due to flooding or other disruptive events. Mr Kelly told BBC Newsbeat: "The water came in pretty quickly and pretty heavily and once we realised, Steve (the pub's owner) drove off to get some sandbags. "I stood and shouted at the water but it didn't seem to do much. Then we realised it wasn't getting any higher and the damage had already been done, so we decided we might as well sit in the beer garden anyway and have a pint."